Colonel William Frasier Fortner II, 74, passed away Sunday, September 3, 2017, in Sacramento, California. He was born October 21, 1942 in Lawton, Oklahoma, to Jake and Nell Fortner. Following his 1961 graduation from High School in Enterprise, Alabama, he earned a Bachelor of Science Degree in Pre-Law and Business at Auburn University. In 1964-65, Col. Fortner was elected President of his school and was selected for Who’s Who in American Colleges and Universities. Col. Fortner was commissioned in the United States Air Force in 1965 and was assigned Pilot Training at Craig AFB, Selma, AL, in 1966-67. He flew as KC-135 Co-Pilot, 913th Air Refueling Squadron, Barksdale AFB, LA until 1969, then he volunteered for the O-2 to Vietnam. He was a night forward air controller and tactics instructor pilot until 1970, flying 356 combat missions over Southeast Asia. His next tour was Aircraft Commander, Instructor Pilot, Chief of Tanker Mission Development for the 912th AREFS, Warner Robins AFB, GA. He was Chief Wing Planner for the 19th Bomb Wing following Bullet Shot and Linebacker Operations in North Vietnam. In 1974, Col. Fortner completed a rated supplement assignment to Minot AFB, ND, 5th Bomb Wing, as an Aircraft Maintenance Officer. He was selected as Top Company Grade Maintenance Officer in 15th Air Force. 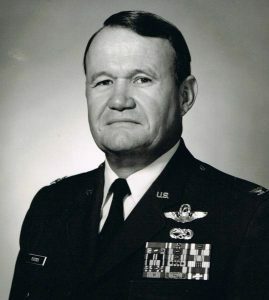 In 1978, Col. Fortner completed Air Command and Staff College and was assigned to Strategic Air Command Headquarters, Offutt AFB, NE, becoming Chief of the Future Systems Branch, Chairman of the Command Control Communications Panel and a Chief Briefing Officer of the Joint Service Connectivity Study Group. In 1981, he became a B-52G Flight Commander and Instructor Pilot, 28th Bomb Squadron, Robins AFB, GA. He was promoted to 19th Bomb Wing and served as Director of Training, Deputy Commander for Operations, and as Squadron Commander of the 99th Air Refueling Squadron. In 1985, Col. Fortner attended Air War College, Maxwell AFB, AL and from there went on to distinguish himself at the Pentagon, Washington DC, as Chief of Strategic Forces Division, Directorate of Programs and Evaluation, Deputy Chief of Staff, Programs and Resources from 1986 to 1989. Col. Fortner’s final assignment was to develop, organize and build the School of Advanced Air and Space Studies for Air University at Maxwell AFB, AL. In 1992, after 27 years of service, Col. Fortner retired from active duty. His superior initiative, outstanding leadership, and devotion to duty reflect great credit upon himself and the United States Air Force. A Command Pilot with over 3300 flying hours, his decorations include Legion of Merit, Distinguished Flying Cross with Oak Leaf Cluster, Meritorious Service Medal with Oak Leaf Cluster, Air Medal with 13 Oak Leaf Clusters, Air Force Commendation Medal with Oak Leaf Cluster, Air Force Outstanding Unit Award with Oak Leaf Cluster, Air Force Expeditionary Medal, Vietnamese Service Medal with four Bronze Stars, Republic of Vietnam Campaign Medal, Republic of Vietnam Gallantry Cross with Silver Star and Republic of Vietnam Gallantry Cross with Palm. After retiring from the Air Force, Colonel Fortner moved to Sacramento, CA and built a Junior ROTC Program at Highlands High School. He taught Aerospace Studies, Aviation History, Leadership, Citizenship and Life Skills for the next 17 years, influencing young teens to love their Country, take pride and serve their Community, to respect themselves, their Family and to take care of their fellow man. He remained actively engaged in Community Service for the rest of his life. He started a YMCA Adventure Guide Program in Sacramento for Fathers and Sons, he volunteered countless hours at his sons’ schools and for after school activities. He served as Flight Captain for 5 years for the Daedalians and a member of the Red River Valley Fighter Pilot Association, “River Rats”. He was Co-Chairman of Veterans for Trump for the Sacramento Region and helped organize a successful rally for our future President, at Sacramento Metropolitan Airport. Frasier was an extrovert and people person extraordinaire. He liked to say he never met a stranger. He loved talking and interacting with everyone. He had a repertoire of jokes and stories that he loved to share at every opportunity. He loved to laugh, and he would light up the room with his big, outgoing personality. He was the epitome of a Southern Gentleman: superb manners, a chivalrous romantic and, above all, a man of honor and integrity. Frasier was a devoted husband and father. He taught his sons that a man’s word is his bond, if he made a deal with you, he would always over deliver and if he was in your corner, he would fight and never give up for you—always finish the job!!!!! He was “War Eagle”, a lifelong devoted alumnus of Auburn University. 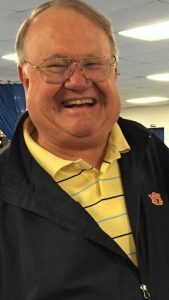 He loved college football and watching the Auburn Tigers, his wardrobe in full of orange and blue polo shirts with the AU insignia proudly displayed. He had a strong, southern accent and when asked where he was from, he would always answer, LA. The unsuspecting person would say, no way you’re not from Los Angeles, and he would smile, laugh and reply Lower Alabama. He loved his cars and he loved to collect things: coins, kites, cribbage boards, etc. He loved to play card games: bridge, cribbage, hearts, gin, solitaire, black jack, you name it, he’d beat you at it. Frasier loved being generous, extravagant, a bit flashy, but overall, he was a conservative fellow. His motto was “never have just one of anything”, and he lived up to that saying. In a way, he even got to live two different lives and two different careers. He married Sandra K. Flickinger of Birmingham, Alabama when he graduated from college, and they were together until he retired from the Air Force. They had two sons, Trey and Todd. When he moved to California to begin his teaching career, he started a new life with future wife, Catherine M. Cook, from Sacramento. They had two more sons, Jake and John. He has three grandchildren, so far, Cole, Patrick and Ava. He is survived by his brothers John and Robert, and his sister Jane. Frasier is being laid to rest at the Dothan City Cemetery, AL, in the Fortner Family Plot. He is joining a long line of family aviation heritage. His grandfather Max was taught how to fly by Orville and Wilbur Wright at Maxwell Field. The Uncle for whom he was named was a super pilot and flew for Eastern Air Lines during WWII and was killed just a week before he was to report for duty with the Army Air Corps. His Daddy, Jake, was one of the original Army aviators during WWII which branched off from being field artillery spotters into using the airplane and an extension of the field commanders striking power. He was installed into the Army Aviation Hall of Fame.